Each year during Diabetes Blog Week, I have the pleasure of “meeting” and getting to know diabetes bloggers who I hadn’t connected with yet. This year, one of the new friends I made was Hilary of Rainie and Me. We’ve conversed by email and over the phone, and I am fascinated by her stories of life with a Diabetes Alert Dog and her work with Early Alert Canines. 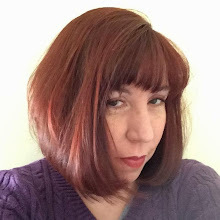 When I asked if she’d like to write a guest post, she graciously agreed! Rainie is my diabetic alert dog, and even though I’ve experienced lots of changes and advancements in diabetic technology since I was diagnosed 55 years ago, nothing has changed my life as much as Rainie has. I hope to explain about diabetic alert dogs (DADs), and tell you some stories about how she has impacted my life. Please note: when I refer to Rainie’s training, or the training of a DAD, I am talking only about the training Rainie has received. I help to train the dogs at Early Alert Canines (EAC), and am supported by EAC’s head trainer, Carol Edwards, in order to keep Rainie certified with ADI (Assistance Dogs International). First, let me answer this question: What is a Diabetic Alert Dog (also known as a Hypoglycemic Alert Dog)? A diabetic alert dog (DAD) has been trained to recognize the biochemical scent that a diabetic's body produces as the blood glucose begins to drop. Upon smelling the scent, the dog will then alert its partner, thus avoiding acutely dangerous hypoglycemia and long-term diabetes complications. Some DADs are trained to smell and alert on the scent of rapidly rising blood sugar also. Rainie and I have been a team for over two years now. When we were placed together, she was a semi-rowdy, 20 month-old, golden retriever/yellow Lab puppy. She was raised as a seeing-eye puppy, but was ‘career-changed’ and trained as a DAD because she is very afraid of motorcycles. Now, she is my best friend, non-judgmental companion and perpetual blood sugar alert system. Because she is a service dog, she can come with me anyplace the general public is allowed. And her presence and constant monitoring allows me to experience a greater peace of mind. I’m more confident because she will alert me before I get into trouble. I like to consider her alerts a warning, as if she’s telling me, “Pay attention to your blood sugar NOW! You’re changing fast.” Her alerts begin as gentle nudges that will get stronger if I ignore her – even to the point of getting my husband, daughter, or a friend if I’m not paying attention. Rainie has been trained to be ‘on duty’ no matter where we are or what we’re dong. She has alerted me in places like the movies, on hikes, while I’m in the shower, in restaurants, at the farmers’ market, on airplanes, working in the garden, at the doctor’s office, while I’m swimming at the gym, etc. She will wake me up at night (which is important), and once got my husband from another room when I was sick with a high fever, and was too asleep to notice her nudges, which proceeded to her lying on top of me. She alerts me when I’m driving, and has blocked me from getting into the driver’s seat when she’s felt my blood sugar is too low – and she was right each time! There are many wonderful things about having a DAD. First of all, her alerting indicates my BS is dropping at this instance. In fact sometimes the dogs alert before the meters can measure a change. They can even smell that your blood sugar is going to drop soon! (And this is much more accurate that the 20 minute delay of a continuous glucose monitor.) The first time Rainie alerted me early, I was at work. I did my BS and it was 180 after breakfast – that number was expected, so I did my BS again 10 minutes later (as I’m supposed to do), and it was about 182. But she kept alerting me! I repeated a test again 10 minutes later, and the reading was 179. Yet Rainie kept alerting. Finally, I tested myself a fourth time, and my BS had dropped 100 points! I was amazed, and ate some glucose. Another pleasure about DADs is that their alerting is consistent and non-judgmental. I don’t tend to get annoyed at Rainie like I would if my husband told me, “Hilary, don’t you think you should check your blood sugar?” I know she’s alerting out of duty and love. And by alerting when my BS (blood sugar) begins to drop quickly, I can often avoid going too high afterword (often called ‘re-bounding). My liver no longer has the need to push glucose out into my blood stream because my blood sugar levels haven’t gone so low that the liver is signaled to correct the hypoglycemia. Having a dog is also a wonderful way to meet people, get exercise, and I find I’m not so self-conscious about having diabetes. People will ask me, “What does she do?” or “What does she ‘early alert on?” and I’ll tell them that she is a diabetic alert dog and smells my low blood sugar. I can then talk about diabetes and DADs without having the focus on me. But I think the best ‘gift’ I get from having Rainie, my diabetic alert dog, is a fuller sense of peace-of-mind. I no longer have to fear that my blood sugar will drop and that I’ll be unaware of it. I can exercise, drive, and do almost anything while not worrying that I’m falling into danger. Because of having diabetes so long, I can no longer feel when I’m going low, and having Rainie’s attention and monitoring makes me feel safer in the world, and during sleep. My family doesn’t worry as much about me either. My husband isn’t afraid to go on long trips because he knows that Rainie will help to keep me aware and safe. And, even with all her life-saving responsibilities, Rainie knows just when to put her head in my lap when life with diabetes has gotten me down. Thank you, Hilary, for giving us some first hand insights on Diabetes Alert Dogs, and more specifically, wonderful Rainie. Come back tomorrow for more about Hilary’s work with Early Alert Canines and how DAD’s are so helpful to people with diabetes. ...here I sit finishing the application for my son (12, a type 1) to have a DAD, and read this amazing share- THANK YOU! What a comfort. So informative! I had no idea of these service dogs. Thank you! I keep researching getting a DAD for my 9 year old son. Thanks for the report! DADs are wonderful! 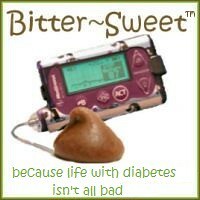 I have some diabetic friends who own one. There are several moms on Facebook who have DADs for their type 1 kids. One little girl has a DAD named Hope and she goes to sleep with her head against Hope's furry coat. These dogs can save lives and are so very important. I love reading the success stoties about DADs. Thanks Hilary, Rainie is a true companion for you! Thanks for sharing your experience Hilary.Rainie is your lifeline and constant "watch dog" angel beside you. What a beautiful gift. Your story was so comforting. After year long journey, we have been able to get our 12 yr old son a DAD. He will come to live with us next month. Your story just affirms that we are making a good decision.